It's a game that really does bring people together. This story was originally published in January. Happy Valentine's Day, PC gamers! Together, Vana Springer and Adam Stevens poured hundreds of hours into the goldenrod soil of Stardew Valley. They watered the ground, they smelted the ore, they nurtured happy little rectangles of crops and livestock, all from the comfort of their dual-TV oasis. Obviously Adam knew that Vana wouldn't believe him when he claimed he had uncovered a fresh Easter Egg laying dormant in the meadow. After all, she knew every nook and cranny of Pelican Town—the tastes and proclivities of its citizenry, the renewable inventory at the Jojamart, the cosmic secrets waiting patiently in the depths of the mine. However, she didn't know that a few hours before Adam armed himself with a shovel and planted tulip bulbs in a chain of tiles until he spelled out a blocky, screen-filling "MARRY ME?" It was silly, it was swelling with light under the crisp morning sunshine, it was perfect. "As soon as she came in the door I told her to go check out the bottom corner of the map. She goes down there and sees the 'A, R, and Y' and was like, 'what is this?'" laughs Adam, bundled together with his fiancée on their couch. "I had walked around and gotten down on one knee next to her, and she was like 'What, what's happening?' And I asked, 'Will you marry me?'" Adam was in a rush. The tulips hadn't sprouted all the way from the dirt, and he test-ran the plan about four or five times to make sure he was able to get in position before Vana discovered the makeshift shrine. He documented the moment on his iPad. It is, and will remain, the happiest day of his life. Vana tells me their proposal story got mixed reviews from family and friends. Some, like her dad, couldn't imagine anything more precious or more personal. Others, like her soon-to-be brother-in-law, were more dismissive: "What are you gonna get married in a Chuck-E-Cheese now?" she remembers with a narrow smile. Those are the predictable reactions from people who cannot, or will not, understand the transformative power of Stardew Valley. The quiet monotony of tilling those sun-dappled fields is either profoundly fruitless or a mind-altering sensation depending on your particular disposition, and frankly, it's difficult for the converted to articulate why all that digital hinterlanding can be so resonant. What I will say is that Stardew Valley is as close as we have to a utopia simulator. It opens with the pipe-dream of abandoning your cubicle to live off the land, and the only win condition is to live happily ever after. What better place to inscribe your holy matrimony? What better place to fall in love? To Vana and Adam, it made all the sense in the world. "We tried to play Rocket League together, and we tried to play Pokemon together, and we get really competitive," says Vana. "With [Stardew] it's relaxed. The way the timing works, it feels like we can play alongside each other, and discovering new things together." "The idea that you can look at each other's farms and get ideas from it—it's cooperative. That's a big part of it," adds Adam. Adam and Vana's very public infatuation is part of a broader trend in the Stardew community. Every week the subreddit is visited by distilled wholesomeness; a daughter who asks to borrow dad's "farming game," a husband and wife adapting the in-game recipes to real life. My favorite, and probably the best example of the effect Pelican Town has had on the gaming psyche, is this image from Ulf Sandberg, 33, in Sweden. 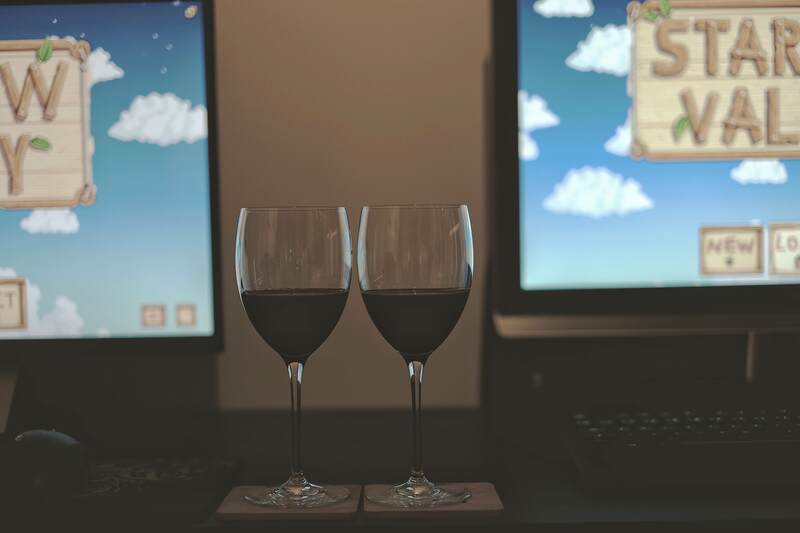 Two tall glasses of red wine, two PCs, two Stardew Valleys. "Saturday evening with my wife." It could easily double as the family Christmas card. Ulf plays with his wife Cecilia on weekends. Like Adam and Vana, they use a dual monitor set-up and sit side by side. They always make sure to log out on the same day, and together they've racked up 320 hours across four separate playthroughs. Cecilia makes the beverage choice—soda, beer, wine, or a single-malt—and the nights melt away in the narcoticizing milieu you find when you've spent a long time in love with the same person. Stardew Valley has often been called a game about escapism. Last year it won a Steam award called, "The World Is Grim Enough, Can't We Just Get Along?" "It's super relaxing. You can talk to each other a lot while playing. It doesn't require a super gaming computer or twitch reaction times," says Sandberg. "It's also a very diverse game, with so many different things to do. I like designing elaborate farms with lots of decorations, end up using up all my wood and stone while Cecilia instead goes down in the mine and beats up slimes, mines a thousand ores and completes her collections and achievements. Something for everyone." Sandberg says his favorite memory with Stardew happened this past June. Midsommar is one of the most important holidays in Sweden, where the locals burn off the endless light of the solstice by dancing around maypoles and binging on massive dinner parties. Ulf and Cecilia felt the usual festive obligations, but they were stressed, tired, and didn't want to face the crowds. "We decided, 'Hey, we're grown-ups right? We can do what we want,' and ended up playing eight straight hours of Stardew," says Sandberg. In spring, Barone will finally release his highly touted multiplayer module, so that the international community of outdoorsfolk can finally play in each other's pastures. This is good news for everyone, but particularly for the Stardew couples. "As soon as we heard it's a possibility we've been talking about it," says Vana. In the near future she will have a husband in real life and on the homestead, and I couldn't imagine it any other way. Stardew Valley has often been called a game about escapism. Last year it won a Steam award called, "The World Is Grim Enough, Can't We Just Get Along?" That's clearly true; the cosmopolitan stresses of our political culture don't feel as pressing when we're watering our potatoes. But I also feel that sells the game short—as if it's only capable of presenting a false reality, rather than expressing some optimistic truths about the human condition. The fact that Stardew has allowed people in love to feel close, to facilitate their affection through a stack of fat turnips, is wonderful. A game like Stardew Valley can be where you hide from the world. It can also shows you what's important.